We offer an intensive range of Non Woven D Cut Bags to our respected clients. The range is manufactured from premium quality raw material and also available in variety of colors, sizes and gauges. These products find their application in varied industries for packaging purpose and are also widely used in mall culture. Apex Nonwoven Bags Pvt. Ltd. In line with clients' diverse requirements, we are involved in providing an optimum quality range of Non Woven D Cut Bag. 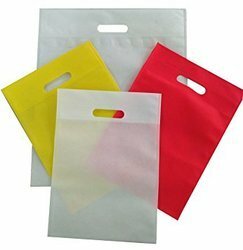 We are devotedly engaged in providing a wide assortment of supreme quality Colored Non Woven D Cut Bag to our clients. The provided bag is perfectly designed using quality approved basic material by our skilful professionals as per the predefined industry standards. Our offered bag is extremely light weight and easy to carry. We are engaged in manufacturing and exporting a unique range ofNon Woven Bag to the customers. They are multipurpose bags and are available in different size to meet the requirements of the clients. 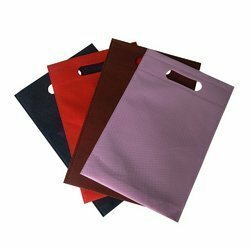 These bags are non woven and are fabricated using premium quality raw material that is sourced from known and trusted vendors.